Like to flick dice, throw dice, or drop dice on or at other dice? Me too. 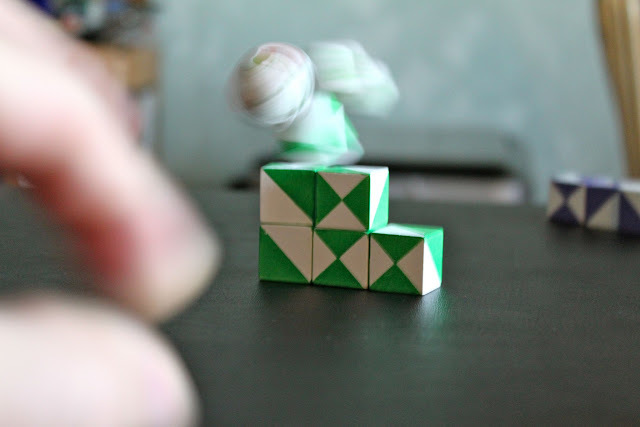 I used to get into dice fights with my brother growing up where we would build the dice up in to massive towers and then start knocking them over with other dice. Eventually the dice would grow into tennis balls, then bowling balls, then straight up fist fights. Ah to be young, dumb, and full of dice. But that is then, this is now. 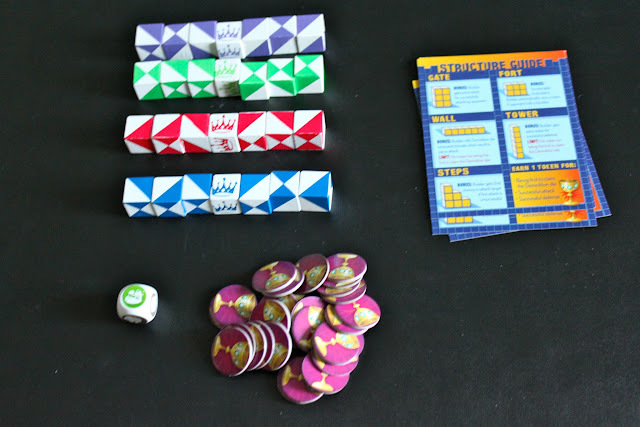 Nowadays, this fun is organized and sold to you as a game that will teach you about patterns and matching too. 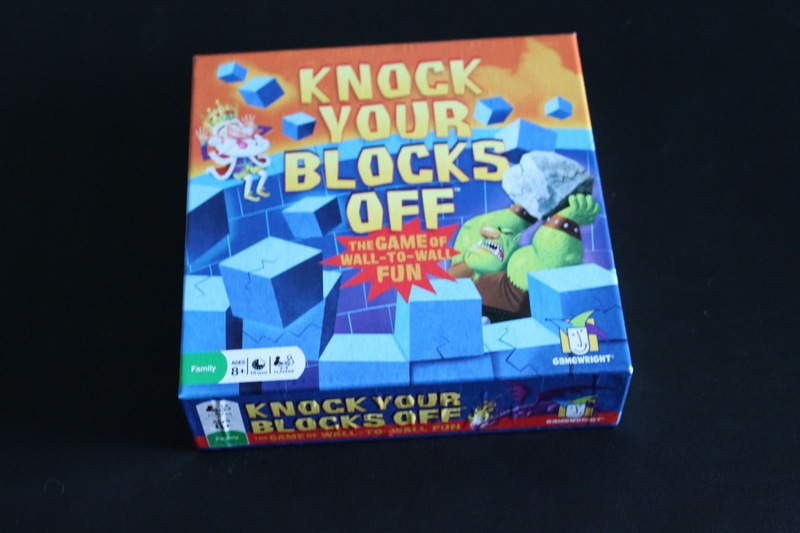 Knock your Blocks Off from GameWright Games is a quick and easy sorta dex game for both kids and adults. In the box you'll find four sets of patterned dice with a matching crown die, a destruction dice, chalice coins to use for scoring, and building reference cards. 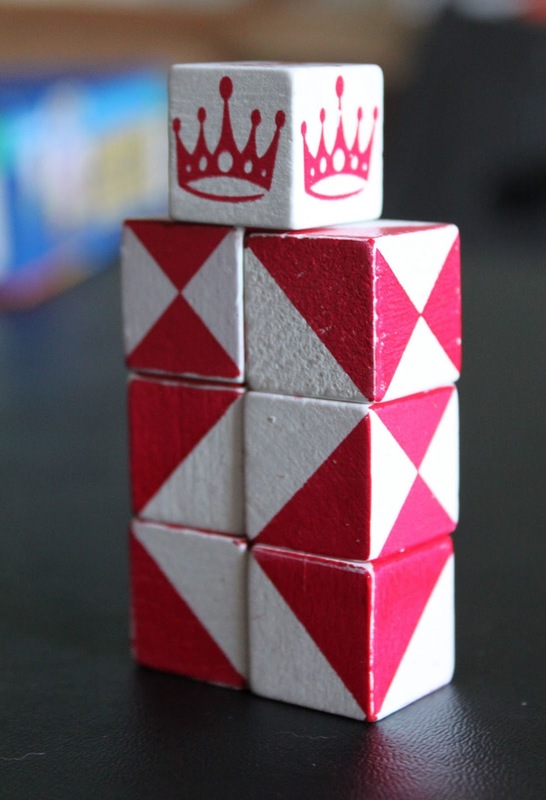 To play the game, everyone races to build a structure listed on their reference card, making sure that the faces of the dice match where they touch (white to white, color to color) and then put their crown die on the top of the structure. First one to build theirs grabs the destruction die from the center of the table. After everyone is done building, players check each others structures to make sure they were build correctly, and then the fun begins. Starting with the player who grabbed the destruction die, players will roll the die and attack another players structure and try and knock the crown die off the top. To determine how you attack, you roll the destruction die, and will either flick it (boulder symbol), drop it (dragon), or throw it (ogre) based on what was rolled. Depending on what structure you build (or your chosen opponent) you will get certain benefits to use when you attack. You might get to attack a second time if you weren't successful the first time, or you might get two rolls of the destruction die and pick which one you want to do. Or, you may build one that is immune to certain types of attacks, making you win automatically. 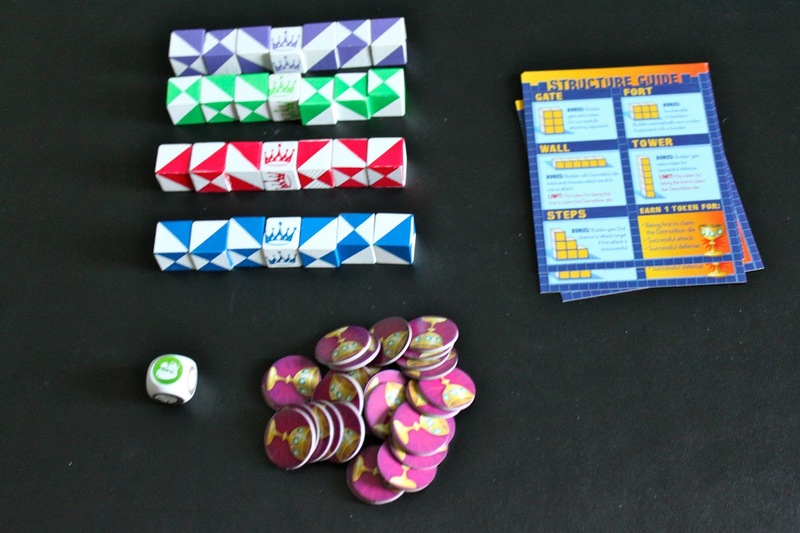 The game is very light, fast paced, and made fun because you get to purposely throw and flick dice at other people. While it is intended for a younger audience, like most GamesWright games its still very fun for an adult group. Even a group of grownups still have problems understanding that color to color actually means color to color. Plus, it easily can turn into a drinking game (for adults) with the incorporation of a few house rules and 6/30 packs. Its definitely not a main course game, but as a filler/"party" game it works great, and can easily be played in 10 minutes. This kind of reminds me of Kingbrick and looks pretty cool. 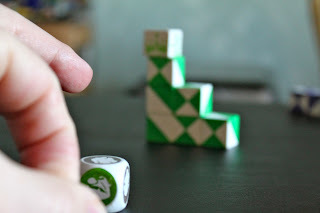 Does it hurt your fingernail to flick the dice? That's always my worry with flicking games. Also, wonderful pictures this week. No,, though I guess in all fairness it depends on how you flick and how you connect. This is the first one that I've played where you are purposely trying to get the dice to launch into the air and knock others down. Even PitchCar, which is all flicking, requires you to flick it in a way that it stays on the table, which is significantly less powerful of a flick than here.